There are those things we eat, make, read, and gush over that are just too good to keep to ourselves. Here, we resist the urge to use too many exclamation points and let you in on our latest crushes. Today: In praise of tangy, sour, rooty, oniony, salty, savory yogurts. Before there was savory yogurt (in my personal yogurt timeline), there was sweet. I was raised, like so many American kids growing up in suburbia in the 1990s and 2000s, on your average grocery-store, fruit-on-the-bottom, and/or occasionally dessert-flavored yogurt. And I loved it; I ate so much of it that I almost certainly owe a significant part of my adolescent bone development to it. So while savory yogurt has been around forever—the original yogurt is, of course, "savory"—my flirtation with savory yogurt began with the advent of Greek yogurt on the American mass market. This coincided almost exactly with my parents' return from an anniversary trip to Greece: They came home with stories of the unsweetened yogurt they'd eaten for breakfast, yogurt so thick you could stand a spoon up in it. And then, almost as if by command, packaged Greek yogurt appeared on the shelves of our local Stop & Shop. We brought it home to our kitchen and doctored it sweetly, the only way we knew. It would be a long time before I thought to enjoy the tang of Greek yogurt on its own—or with olive oil or herbs. I didn't know what labneh was until I started college in New York. And I still love sweetened yogurt—well, unsweetened yogurt topped with jam or honey or fruit. It's what I eat for breakfast most days, and in terms of yogurt, this mode probably holds the biggest part of my heart. But there is a whole host of downright swoony savory yogurts—strained, like Greek and labneh, and otherwise—and my crush is deepening all the time. But there is an important distinction to be made between unsweetened yogurt and savory yogurt. It's the rectangle-is-not-a-square rule all over: In my book, at least, unsweetened yogurt can be savory, and often is, but it is just as often intended to be sweetened; savory yogurt, on the other hand, is unsweetened, but meant to be enjoyed as is, in all of its salty, tangy, no-fruit-to-be-found glory. I would categorize my first foray with Greek yogurt as an unsweetened yogurt adventure. I sweetened it gleefully and with a heavy hand. If you've not yet begun your foray into savory yogurts, here's a primer: There are yogurts flavored with sea salt (like Sohha), yogurts that are rooty (like Blue Hill's parsnip yogurt), yogurts that are oniony (like White Moustache's spring shallot yogurt), yogurt that's sour or even intense. Some of them sound a little weird (Blue Hill even has a tomato yogurt), but they merit a try (it's delicious). It's hard for me to name exactly what I like so much about savory yogurt, but I think it's a sense of integrity: They are boldly tangy and milky; they ask to be riffed on, to be used creatively. 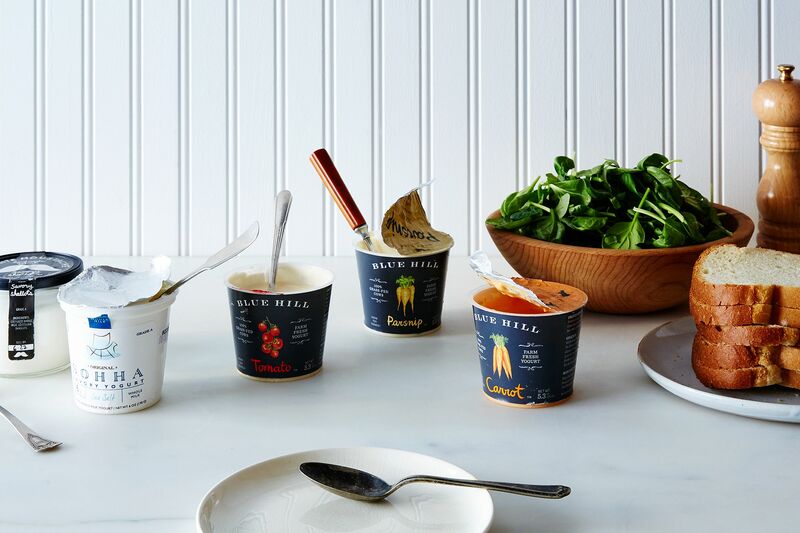 If you're looking for a fling, savory yogurts lend themselves so well to being condiments—but if you're looking for something more serious, try them all on their own. Swirled with olive oil, flaky sea salt, and spices (like red pepper flakes, sumac, or za'atar)—yep, just eat this with a spoon. Are you team savory yogurt? Sing its praise (or, okay, your skepticism) in the comments. With a slight edit - the original savory yoghurt is Bulgarian, not Greek :). Sohha changed my yogurt game indefinitely. It makes its appearance with anything that's super spicy, acidic or just needs a little creaminess. Amazing stuff! I've been making yogurt for decades and for me there have always been savory versions. Cucumbers and onions prepared as for gurkensalat with dill and added to yogurt instead of sour cream. Celery diced fine with caraway seed and toasted nuts is a favorite. Tomatoes are definitely complimented by yogurt. I've also been known to stir a couple of generous tablespoons of tabouleh into a cup of yogurt. And I often add salsas to yogurt and eat it as a dip with various types of chips for a snack or light meal. I couldn't agree more - I love savoury yoghurt! Makes such a great dip! Add some seeds, nuts, flaky sea salt, chopped herbs and extra virgin olive oil with some baguette crisps and you're sorted! i've never heard of broken shovels! i'll have to keep an eye out. thanks for the recommendation! Caroline - check out Stonyfield Smooth and Creamy lowfat plain yogurt - I use it for all Indian recipes/raitas/yogurt rice. Enjoy! No probs. I think they are still small batch producers. But I think they might have a website now with more information on where you can get it. Happy eating! In the early days of Stoneyfield Farm, the late 70s or early 80s, I think they had some short-lived savory options, like cucumber. I've always regretted them giving up, figuring they just timed the American market a little bit wrong. that is so interesting! think they'll make a cucumber-yogurt comeback? Yes!! I bought tzatziki at the farmers market on Sunday, and I've been eating it like onion dip with potato chips. So tangy and delicious and refreshing! Try cold, plain yogurt with salt, cumin powder and red chilli powder. Tastes great with roti, nan, or even better, stuffed paratha. I also add plain yogurt to my guacamole to give it some more richness. White rice, plain yogurt with some salt is my absolute comfort food. And with that last fact, I just made it evident that I grew up in India! Yogurt rice with mustard seeds and cilantro is also my fav comfort food! It's truly the best. such great ideas!! thank you! I actually love plain yogurt mixed with a spoon of Indian lemon or mango pickles - salty, sour, creamy! Mint and yogurt--so great, could go savory or sweet! yes! something so cool and refreshing about the combo. Raita is a favorite snack and condiment in our house too! In summer we mix sweet corn in the yogurt along with chopped tomatoes, radish, mint, cilantro, salt and some ground, roasted cumin seeds. Perhaps a sprinkling of chaat masala too. 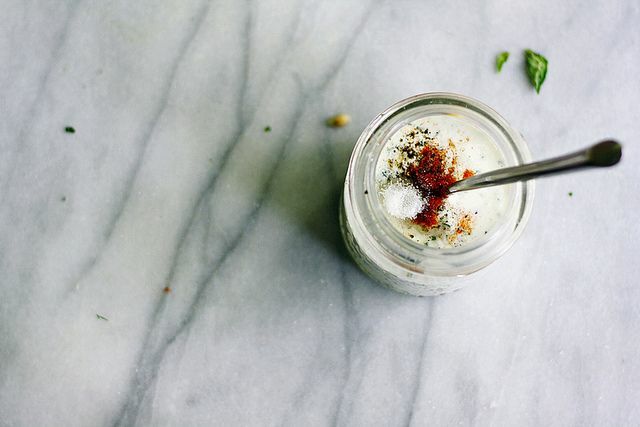 Savory yogurt is a staple in a few different cultures. I am a second generation Indian American born and brought up in the US and I was raised on savory preparations of yogurt in the Indian cuisine. Dishes such as raita which integrate yogurt with cucumbers, tomato and perhaps some toasted cumin seeds are a welcome and perfect balance to the more spicy dishes in Indian cuisine. Some curry dishes, and salted lassi (yogurt drink) are also examples of savory preparations of yogurt. A few years ago I got to sample similar dishes in Turkey and other middle eastern cuisines...love it all and in fact prefer it to sweetened yogurt. i do, too, tara! i've been meaning to try a salted lassi. I am launching a company to bring Raita to market as a savory yogurt. First two flavors are Cucumber, mint and cilantro and a Spicy Carrot. Launching in Michigan and hope to expand in the next year. I will look forward to your trying it and giving me feedback!